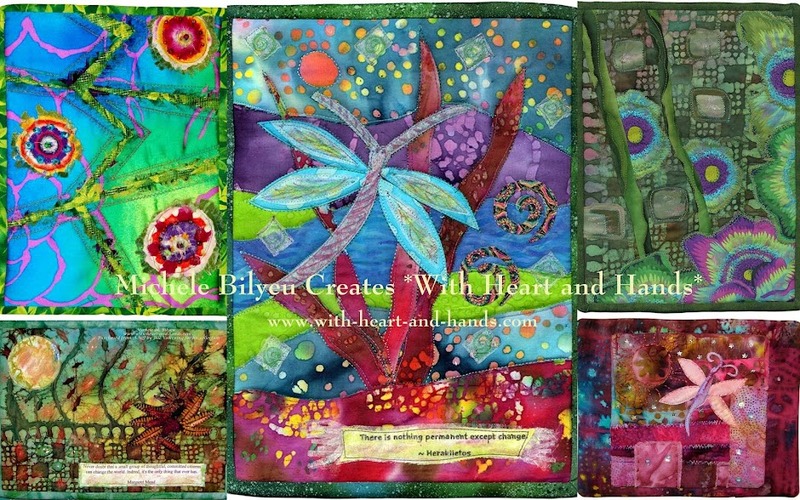 Michele Bilyeu Creates *With Heart and Hands*: Sisters Outdoor Quilt Show: Diverse, Modern, Liberated and Fun! 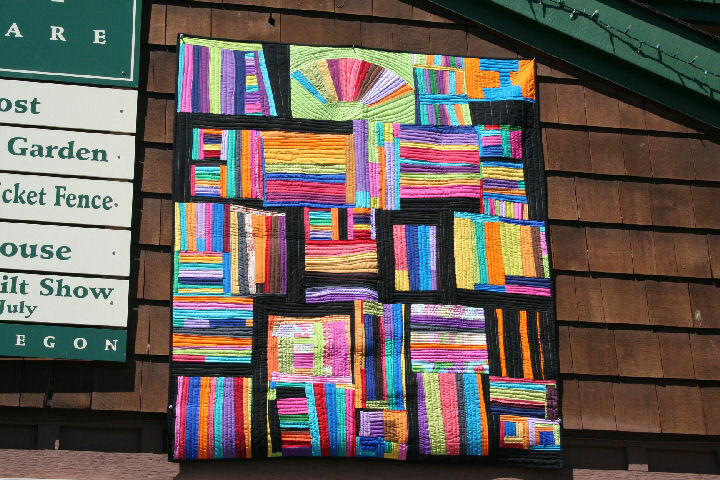 Part 2 of the Sisters Outdoor Quilt Show 2011 begins with "Zipper Mania" with Wendy Hill. Wendy had her work showcases at the Sister's Public Library..right as you entered! And you knew with a glance that form, not function, is at the heart of this artist's creations! 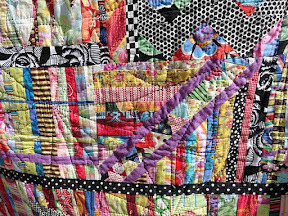 Wendy has been collecting zippers since 2008 for use and reuse in her modern art quilts and other projects. Most appeared to be made from those giant industrial zipper rolls you buy new that seamstresses use. The colors were amazing fun and her gift of creative lines and other projects were impressive! 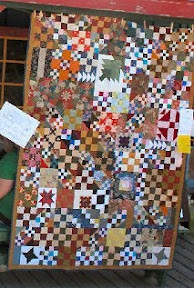 Yes, she quilts with zippers...some open, some shut...but none should be pushed or pulled or touched ;) And yes, I wanted to but I resisted! 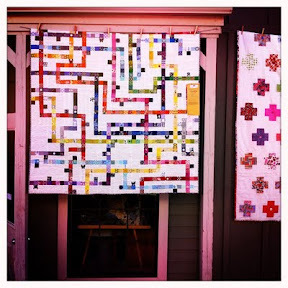 That's a zipper quilt..all zippers!... another one, below...zippers! And yes, this is curved quilting ...with zippers every where! More zippers, more art...sorry it's through a glass cabinet door, but I didn't want the alarms to go off, or me to be wearing zippered handcuffs in order to take clearer photos! Zippered modern art ala those pencil creations you see online and other fun zipper odds and ends. 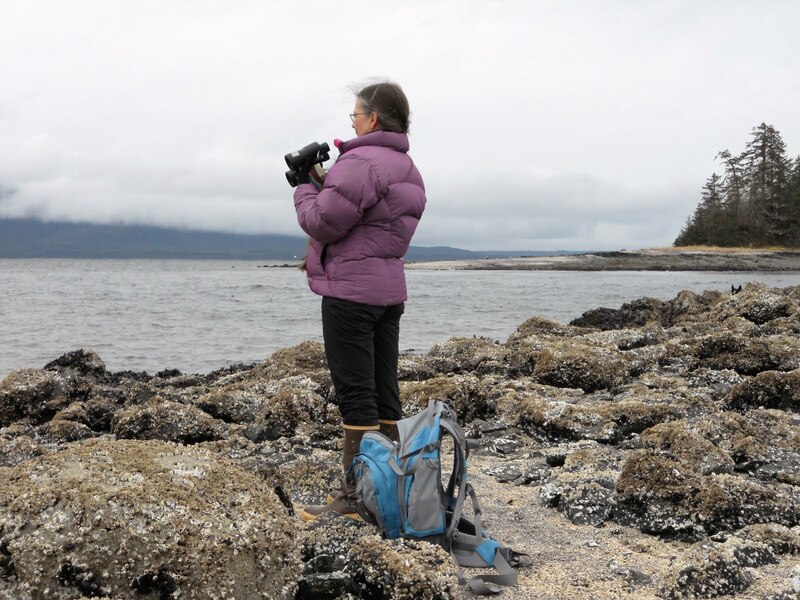 We are all standing in the opening to the Sister's Library.....like tight little pieces of gum in a foil packet.. ..all trying to take photos without each others hands, purses, backs, or cameras in the way. Plus they have public bathrooms and the aisle to the photos below are there in front of them! The one in the middle, above, had to be seen to believed. I saw it, not sure I totally believed it..so much detail, I wanted it lower down and closer up or maybe I just wished I'd had a ladder to get up there! Looked way, way up to see some liberated letters ....I've seen this from one of 'us' who blogs...anyone know whose it is? Tonya Ricucci did! 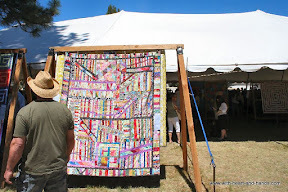 She recognized it as Kristin Shield's..one of our Liberated quilters from Bend, Oregon. 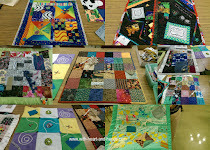 Looking inside the Stitchin' Post at employee quilts...looking, looking....for that which is just off the map a bit...here on the left, below...off the grid, and on the right..on the grid, traditional but lovely Kathy D and her Material Obsessions! 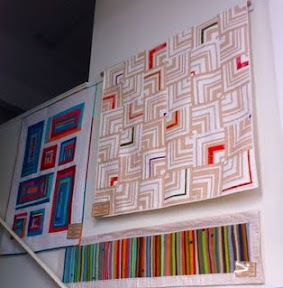 But she also made some of the liberated quilts shown in this post, as well! Liberation and the freedom to always think outside of a building, outside of a box, and around each and every block always exists.....it's up to you to discover it! 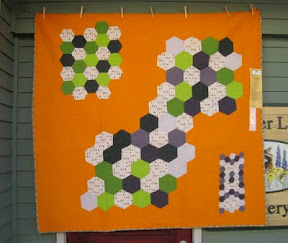 I'd call these Liberated Hexagons on the right above..heck, there not acting like traditional ones! 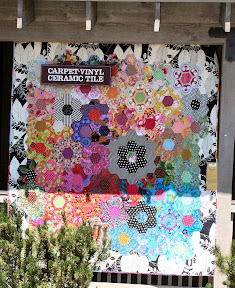 (the carpet sign hangs from chains at the store front, n front of and not the quilt...) This is another Kathy Doughty of Material Obsessions. A variety of others..notice the guy? We had tons of men...looking, photographing, and admiring in general! 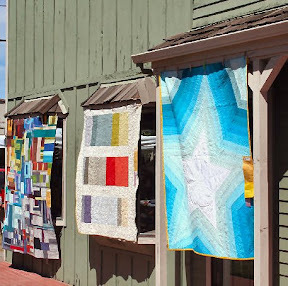 Who know, some were probably even quilters! Go guys!!! 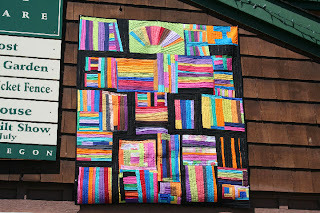 (Kathy Doughty, I do believe) had a blast just piecing her strings every which way ala Anna Williams or passage quilts style. And this one is for Liberated Cowgirls and Guys! Hey...is that a liberated or a modern Robot! He seems friendly! And it's Sisters Oregon, y'all!!! 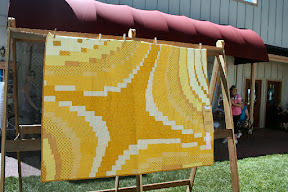 It was a great one day show, with so many quilts that it will take a few more posts to showcase all of my photos.The Sisters Outdoor Quilt Show..nothing in the world quite like it! 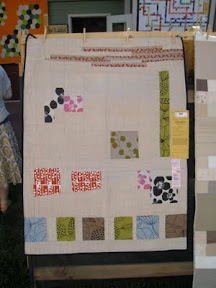 Those zipper quilts are awesome. 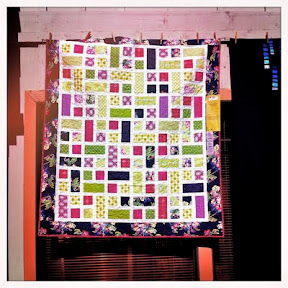 Love those liberated quilts at the end of your post. 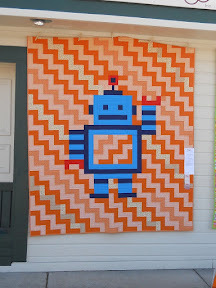 That Anna Williams styled quilt is gorgeous and I love the Robot. I bet I know someone who took a photo of that too. I'm following and I haven't had to change the link. What fun! 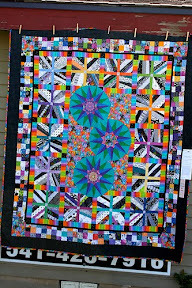 I saw so many quilts that I liked...wish i could have been there in person! It truly is a treat to see this show! 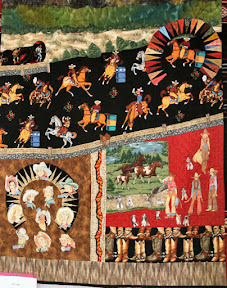 I'm amazed at all the quilts! Wow, wow, wow and wow! I want to go to Sisters! 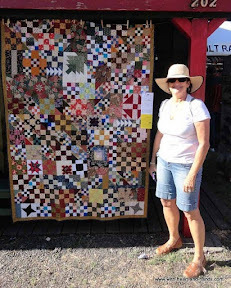 Those zipper quilts are astonishing- I also love the beautiful liberated quilts with all the wonky squares. I found this post on facebook but I will make sure that I am one of your followers. Love both of these last posts. Thanks so much! fab photos! 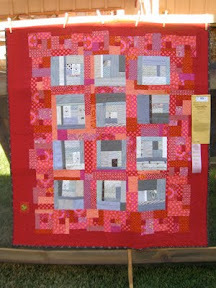 that wonderful red and white houses and letters quilt is by Kristin Shields of Stitching Hands (formerly Knit One Quilt Too). 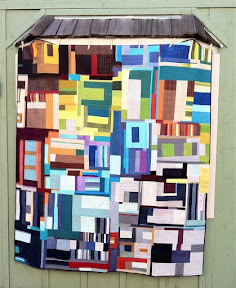 love that quilt. At least I got to see that one, most of these I didn't - including the robot.